Alas, Easter Sunday has come and gone, and our homes are riddled with crumbs, green paper grass, remnants of candy wrappers and plastic egg carcasses. They're also riddled with crushed hopes and dreams here in Miami, as many of us head back to school or work after Spring Break. It's also just Monday, so that in itself is terrible. But I'm here to bring you some fun ideas that are sure to cheer you and your tot up if you're in a sour mood. Today, I bring you this post in hopes that I'm not too late, and that you still haven't picked up those eggs and tossed them in the trash! I love a good upcycle, so this post is dedicated to putting those eggs to good use well beyond your egg hunts. As a preschool teacher, I’m also a stickler for developmental activities, especially the kinds that are age appropriate, and that’s just what I’m bringing you in this post! These activities are great for babies 9 months all the way up to 2 years, and I’ll break down just why and how under each. So let’s get cracking (pun intended)! No soup in sight! (Clearly, I’ve got puns for days right now.) For this, you’ll need a tall, round canister, like a Pringles container. Baby can have fun dropping eggs in and pouring them out. 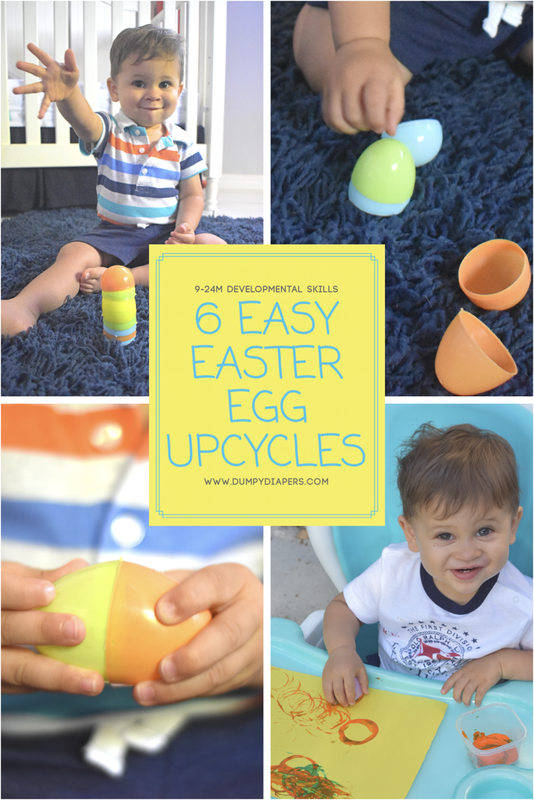 You can encourage them to practice rolling the canister and eggs around as well. This is great for the 9-12 month stage, when baby should be showing an interest in rolling wheeled toys or 12-18 months when baby is practicing placing small objects into small containers! So this one is just fun and great for baby’s fine motor skills. If you follow me on Instagram, you’ve heard me talk about egg-shaped art supplies being the most developmentally appropriate for kids under 3. 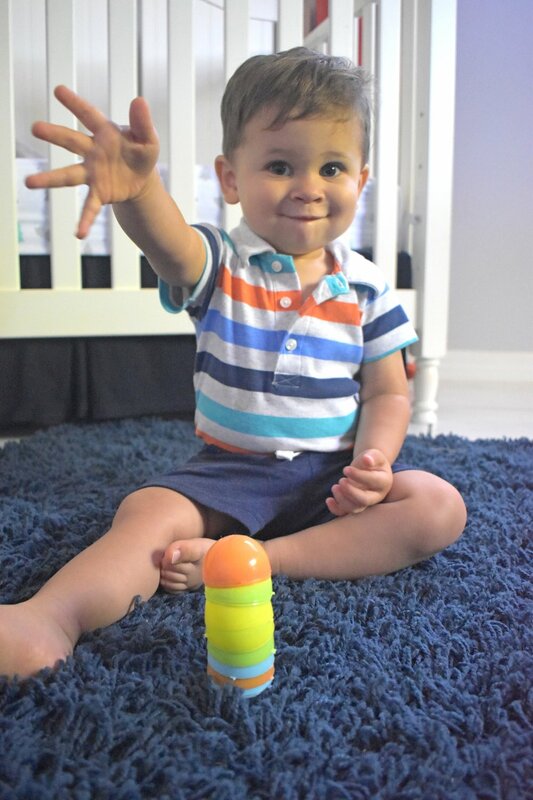 We use egg-shaped sidewalk chalk and crayons, and they’re super easy for my little guy to grip at 16 months. So stamping the Easter eggs themselves in some Tempera paint is a simple and fun activity for any little Van Gogh! We did it! Ready for my celebratory high-five, Mama! All you need here is the eggs themselves. Open them up and have baby practice stacking the halves on top of each other. That’s it! This is another good fine motor activity for kids to practice pincer grasping the pieces, and also good for 18-24 month olds who should be working on stacking 6-7 stackable objects. Baby can also practice differentiating “on” and “in” with a bin and some direction from you, which is a great 12-18 month skill. It’s funny how the simplest activities have the most endless possibilities! Just look at those little fingers working so hard. Another activity with just the eggs, though you can easily enhance it with visuals like flash cards or construction paper. Separate your egg halves again, scramble them up and have your child find the matching parts. You can modify this activity for younger babes by showing them only one color at a time and having them choose the matching end from a smaller selection of two or three colors. This is a great activity to start practicing even with a 1 year old, just to introduce the colors into baby’s vocabulary. You can expect correct matches to start happening around 18-24 months. If you have different sized eggs on hand, you can also practice size words and sorting those! Letting baby try to put the two parts together is also great for fine motor skills. Most any baby loves the sounds and sensations of ripping paper. Put that to good use and give your kiddo some old tissue paper or some of those junk flyers we all get in the mail if you’re not a germaphobe to rip up. Have your little one practice stuffing the ripped paper, or any of that grassy basket filling laying around into the eggs. More fine motor skills at work, and great for 12-18 month olds practicing placing small items into small containers. Use your kiddo’s natural love of all things noise to your advantage. This is the most complex activity, if you can even call it that. In addition to your egg, you’ll need two plastic spoons, washi or duct tape and some small beans or rice. If you don’t want a mess on your hands, you can fill the eggs with rice or beans yourself, or have older babies help by letting them scoop the filling from some rectangular Tupperware, or even a shoebox. Once your eggs are filled, place your spoons inward facing on opposite sides of your egg, like they’re giving it a little spoon hug, and hold them in place with your tape. Now your little one can shake, shake, shake and groove to their heart’s content! We tried all of these activities at home (even though I totally forgot my camera for half of them) and they were a hit, so I hope they will be in your house with your tots, too! So hop to it (had to do one more), hope you all had a wonderful Easter full of love, and have fun!